Our 1 bedroom Zirconia executive apartments are an ideal alternative to hotels and serviced apartments, especially for corporate guests, contractors sharing and families. These properties are located in our brand new Zirconia building in Braddon which was completed in September 2011. All apartments have brand new furniture and equipment and with well designed modern living spaces. 1 bedroom apartments are located on the first and second floors and there is a lift in the building. The bedding configurations are flexible with a king bed that can be split into 2 x single beds. Each apartment has a large flat-screen TV, DVD player and Stereo with iPod Docking Station, along with free Wi-Fi. Kitchens are fully equipped with the latest Italian appliances to make cooking (and cleaning up) a pleasure. The apartments include r/c air-conditioning and a fully equipped laundry. 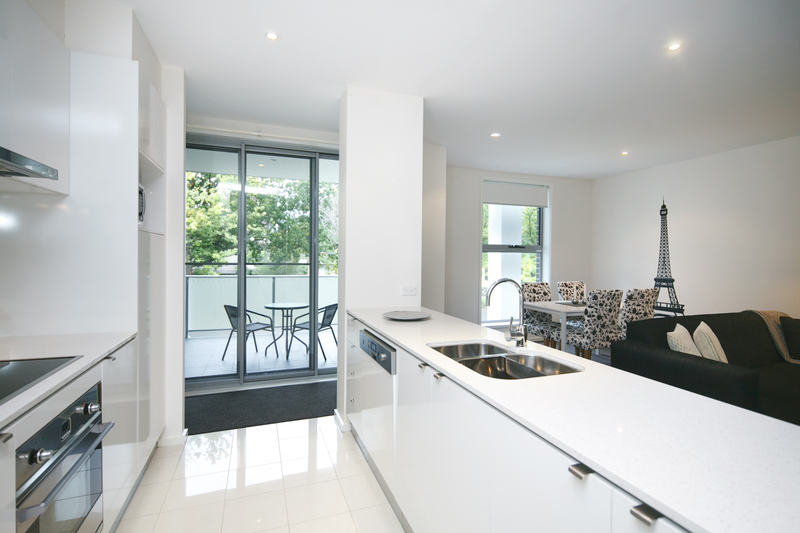 Just outside is a private furnished balcony, as well as lovely gardens if you would like to venture a little further. The building is secure with undercover parking and intercom access for visitors. Best of all, you will be only a short walk away from the CBD and the fabulous restaurants and cafes in Braddon. Adjacent is a park with a playground, as well as a small supermarket and an excellent Turkish take away shop. Click here to Book Now. We accommodate anyone needing temporary self contained Canberra accommodation. Book us for self contained executive apartment accommodation for your short term, long term or temporary furnished apartment rentals. Perfect accommodation for Corporate Consultants, Government Contractors, Renovators, Diplomats, Relocating & Family Holidays. Calling the League of Extraordinary Women!